Amy Adams showed off her bunions once again in a black-and-white suede version of the celebrity-favorite Calvin Klein “Camelle” sandals. The 43-year-old actress has exposed her foot deformity numerous times before while wearing several pairs of shoes, including Tom Ford padlocked sandals, Jimmy Choo platforms and gold Kurt Geiger “Bond” pumps. Though it looks like Amy has embraced her foot flaws, she might want to read up on our tips on how to treat painful bunions and prevent them from worsening. Amy Adams exposing her bunions in Calvin Klein mismatched sandals paired with a Calvin Klein by Appointment dress. Closeup of Amy Adams’ painful-looking bunions in Calvin Klein “Camelle” sandals. Foot deformity aside, Amy looked amazing in her impeccably tailored Calvin Klein by Appointment black ankle-length dress with long sleeves and a plunging neckline. In addition to her jeweled Calvin Klein heels, the “Arrival” star piled on more bling with Cartier jewelry. 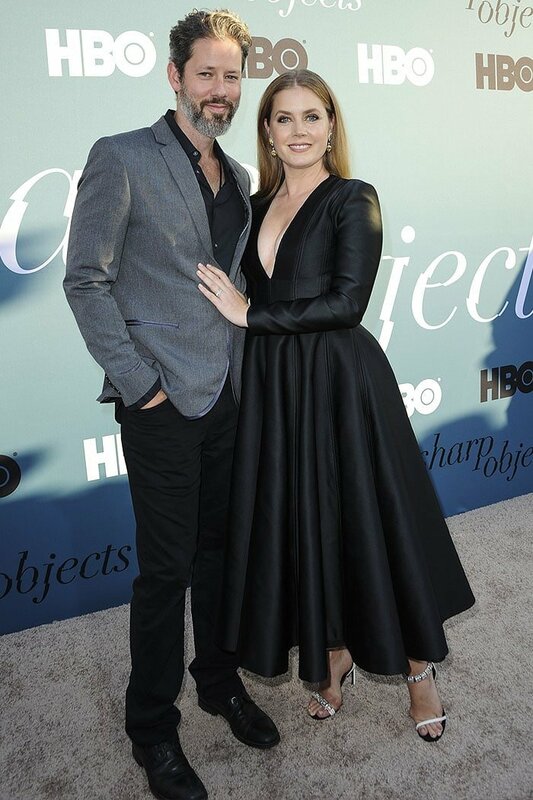 Amy Adams wearing Cartier jewelry. Amy Adams at the premiere of HBO miniseries “Sharp Objects” at the Cinerama Dome in Los Angeles, California, on June 26, 2018. Check out these same Calvin Klein mismatched sandals on Margot Robbie, Selena Gomez, Nicole Kidman, Kate Bosworth, and Naomie Harris.